The single currency rebounded after holding above indicated support at 131.75, however, euro met resistance at 133.50 and has retreated again, suggesting further sideways consolidation would take place, however, as long as said support at 131.75 holds, bullishness remains for another rebound to 133.50, then towards 134.00 but break of recent high of 134.41 is needed to confirm upmove has resumed and extend further gain to 135.00 but loss of upward momentum should prevent sharp move beyond 136.00-10 and reckon 136.95-00 would hold, price should falter well below 138.45-50 (1.618 times extension of 109.49-124.10 measuring from 114.85). The daily chart is labeled as attached, early selloff from 169.97 (July 2008) to 112.08 is wave (A) of B instead of end of entire wave B and then the rebound from there to 139.26 is wave (B), hence, wave (C) has possibly ended at 94.12 with a diagonal triangle as labeled in the daily chart, hence upside bias is seen for further gain. Recent rally above indicated retracement level at 116.69 (50% Fibonacci retracement of the intermediate fall from 139.26-94.12) adds credence to this view and signal major reversal has commenced but first leg of this wave C has possibly ended at 149.79, hence wave 2 has commenced with wave A ended at 126.09, followed by wave B at 141.06, wave C commenced and could have ended at 109.49, indicated upside targets at 126.00 and 130.00 had been met and further gain to 135.00 would follow. On the downside, whilst initial pullback to 132.20-25 cannot be ruled out, still reckon said support at 131.75 would hold and bring another rebound. Only a break below this level would signal a temporary top is formed, bring retracement of recent rise to 131.00 and possibly test of support at 130.62 but downside should be limited to 130.00 and strong support at 129.37 should remain intact, bring another upmove later. Recommendation: Hold long entered at 132.70 for 135.00 with stop below 131.70. 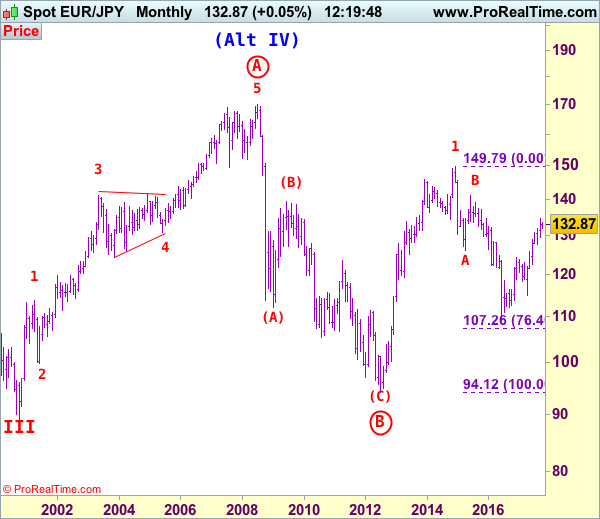 To re-cap the corrective upmove from the record low of 88.93 (18 Oct 2000), the wave A from there is subdivided as: 1:88.93-113.72, 2:99.88 (1 Jun 2001), 3:140.91 (30 May 2003), 4:124.17 (10 Nov 2003) and 5 ended at record high of 169.97 (21 Jul 2008). 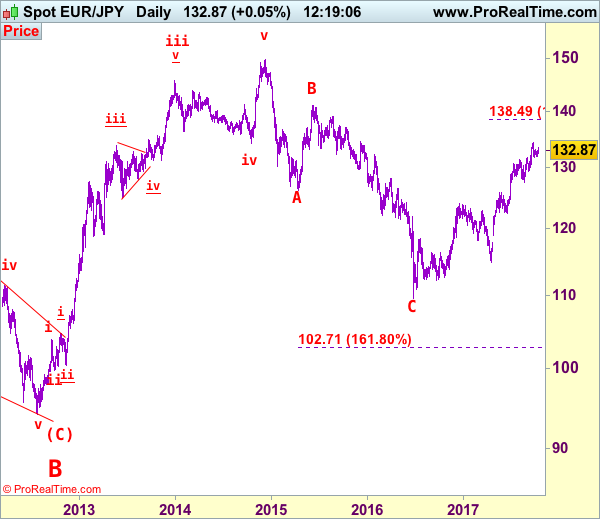 The brief but sharp selloff to 112.08 is viewed as a-b-c x a-b-c wave (A) of B. The subsequent rebound to 139.26 is (B) of B and (C) of (B) has possibly ended at 94.12 and in any case price should stay well above previous chart support at 88.93, bring rally in larger degree wave C towards 150.00.